What I am about to discuss is far from basic however. I want to give a little bit of background about how this blog post even came about. I saw a facebook post recently asking what a good follow-up plan would be in the below scenario. You’re an automotive salesperson doing follow-up and a referral is sent your way by a friend. The referral does not buy a vehicle the time of his first visit with you – and it is now the next day. How do you follow-up with a potential customer who met with you (test drove, got some figures) and did not end up doing business? Given the scenario – there is one thing you always need to remember. The phone will be your strongest asset to scheduling appointments and be-backs. Period. The phone call is a live conversation and going to be the next best thing to a customer being face to face with you/with their product specialist at the dealership. Oh but Elise, my customers like to text! Or perhaps a customer wrote you an email and instinctively you write an email back. But… are you ever in a good texting conversation or email thread and then the customer stops writing? That’s the downside – email and text are great tools to use in follow-up, but should be directed at getting the live phone call. During a live phone call you can know what the customer/audience is thinking in the moment and will be the best way to overcome any objections that are coming up. On top of that – you have your voice and ability to personalize your voice when you are on the phone. Text messaging and email lack personalization and often times can be misunderstood. They are only words on a screen. It’s time to get motivated and excited about follow-up. Your phone skills should be on fleek – so much in fact that you know when you get a client or potential client on the phone it will result in an appointment 100% of the time. When you have a live conversation on the phone with a potential client/client it will result in an appointment 100% of the time. Plan on going through this blog in the above scenario and taking notes. You will find step by step my proven process. To refresh you again on the scenario – the below are some alias character names. 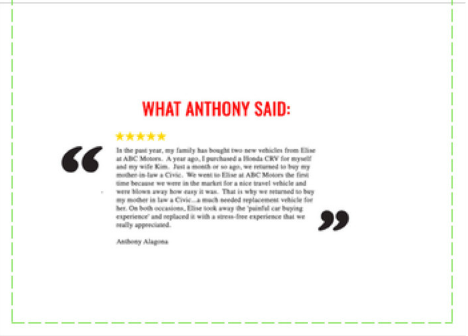 Anthony is your friend and sends you a potential customer John. John came into the dealership to meet with you and you test drove a couple vehicles – a Honda Civic and Tacoma. He wasn’t sure what he wanted to do at the time of visit and left the store without buying anything. How do you follow-up? How do you get engagement? How do you get an appointment? 0:10 – 0:14: GIVE REASON TO CALL BACK: I did want to reach out in regards to our visit – I had a couple quick questions. 0:15 – 0:25: SHARE CONTACT INFORMATION: do me a favor and ring me back. This is my office line that I am calling from. It’s going to be 805-441-3398. 0:26 – 0:25: SET EXPECTATION: it’s right about 9 o’clock here on Friday morning. I will be in the office until about 6 or so this evening and I will be sure to connect with you again and let Anthony know that we spoke as well. Looking forward to connecting. Thanks so much again. Bye bye. • Video email will set yourself apart and create a wow experience for your customer. They may have a preconceived notion of who you are in their mind…” a car sales person”. voicemail repeating the message of expectation that you will reach out again. DESCRIPTION OF ABOVE VIDEO: this would be what the customer would see in their inbox. This is the mobile version assuming increases with mobile users. The video email would come through with a moving image (not a freeze frame) to actually click the video. There is a short blurb below the video. Customer clicks on video, watches video and previews over your text. They also may click on a financing app, directions or any setup call to actions. All movement on what the customer is doing (opens of email, clicks on video, clicks on any buttons with call to action or social media) is trackable and notified on the sales rep’s phone. • most CRM’s allow for a permission opt in that will allow you to text if the customer texts “yes”. • use text as a tool to get engagement – but not to have a full dialogue. Guide your text to the live phone call unless the customer absolutely says they only will text or email. 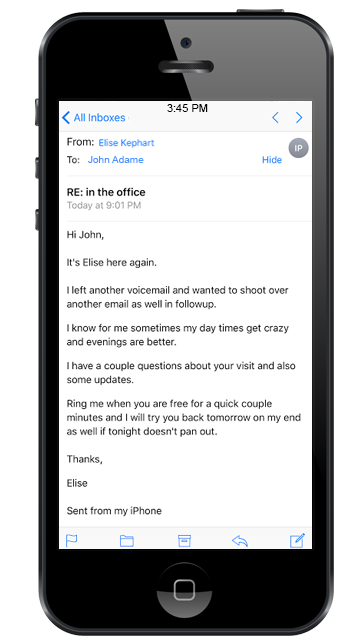 • texts (and email) are only words on a screen and you don’t have the same abilities to use tone inflection and have a live guidance plan like you do on a phone call. You often times have to wait for the customer to reply back, they can at any time choose to not text back and overcoming objections are more difficult. DESCRIPTION OF ABOVE VIDEO SHOWING A TEXT OPT IN CONVO: this would be what the customer would see in on their cell phone. Once opted in and they text back “yes” send your video email in text format as well. All this is guided to sell and get the live phone call. • tools to keep by your side: a sharpee, a stack of manilla envelopes and my exclusive card sending platform. 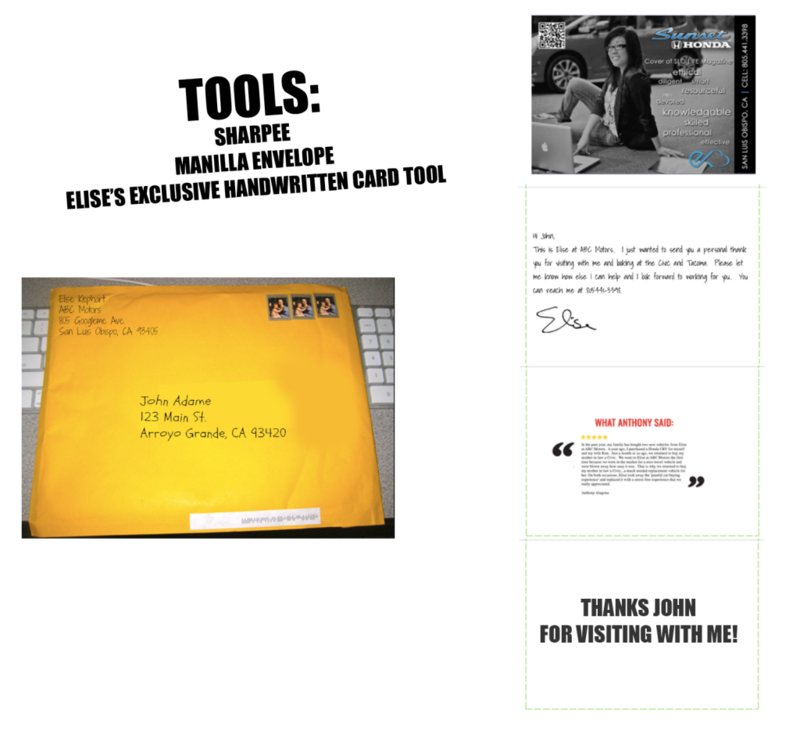 • this card sending platform allow you to send a handwritten card from your computer. It will deliver in a couple days. • use this card to be personal and also get the call to action that you want to help and make connection again. DESCRIPTION OF WHAT’S IN THE CARD: this would be what the customer would receive in the mail. It would come delivered to them in a yellow envelope with their name and address handwritten/sharpee’d. This will help stay a long the lines of being personal because it is handwritten. When the customer opens it you can create inside essentially whatever you want but here is how I would break it down. OUTSIDE: This is the outside of the card. This is your cover and what the customer will first see. FIRST FLAP: When they turn up the card, this will be the next message. TOP OF CARD OPEN: Once they open the card fully, this is on the top. In this example it is the referral’s mutual friend Anthony when he bought a vehicle. MIDDLE OF CARD OPEN: Once they open the card fully, this is in the middle. This is the handwritten part. You can use a mockup of a handwritten font (top portion) or can actually create your handwriting as a font (signature part). This emphasis’ that it is personal. You are giving the customer personal attention that no one else is. In the past year, my family has bought two new vehicles from Elise at ABC Motors. 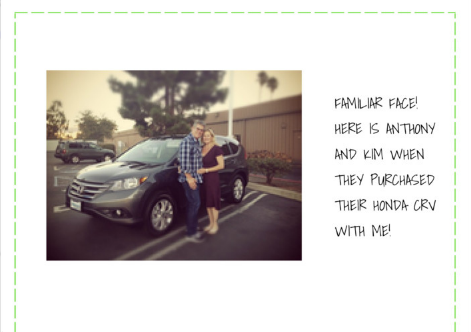 A year ago, I purchased a Honda CRV for myself and my wife Kim. Just a month or so ago, we returned to buy my mother-in-law a Civic. We went to Elise at ABC Motors the first time because we were in the market for a nice travel vehicle and were blown away how easy it was. That is why we returned to buy my mother in law a Civic…a much needed replacement vehicle for her. On both occasions, Elise took away the ‘painful car buying experience’ and replaced it with a stress-free experience that we really appreciated. • you want to call from a second phone number so that the customer will not recognize it as your number you called from earlier. Call from your cell phone or use my special tool to change up your phone number you are calling from. • use my special tool that you can have access to that allows you to mask your phone number to any area coded number and route it back to your cell phone or office line. • if the customer (John in this example) has an out of area code phone number – change your number to that. For example – let’s say your dealership/local area code is 760 and the customer’s is 805. Change (with my tool) your phone number to an 805 area code number. • another phone number area code that peaks curiosity is 808 which is Hawaii. Call from an 808 number and it will show Honolulu, HI calling (in the video). • this call goes much faster because you hang up once you hear the customer’s voicemail hit. DESCRIPTION OF VIDEO ABOVE: this would be from the customer’s (John) view. He would see an unrecognized phone number and may miss the call and it will show up in red on his missed calls. Often times the customer with no voicemail will call the number back which will allow you to make connection with the customer. • ABOVE DESCRIPTION: this is an example in CRMSUITE (also works in VIN, Dealersocket, CDK, Reyrey, Elead and any CRM that will allow template building) of how to organize the templates. By pathway, after phone calls and by email number. • this is an email to follow-up with your second attempted phone call. 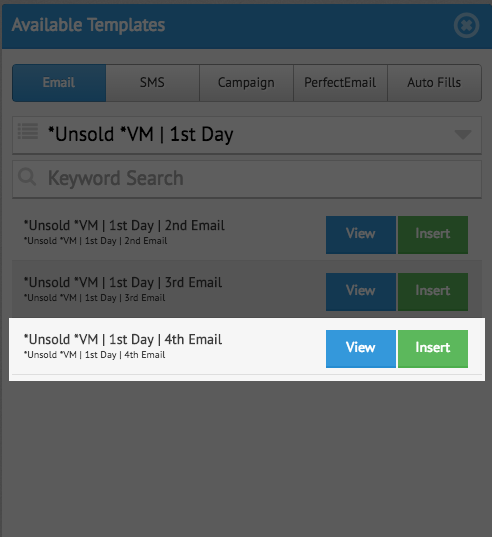 This is one of my exclusive email “templates” that are built into your CRM for easy drop and send ability. • This particular example is an example for a customer (John) who came into the dealership and did not purchase. This customer is an “unsold traffic” customer. • sign your email “sent from my iPhone” to add the personalized touch. This gives the impression that this email is not a template. No customer wants to feel templated or automated. • GET ACCESS TO MY ONE OF A KIND EMAIL TEMPLATES. OVER 600 OF THEM! If you are like me you hate templates because they sound like a template. These are all templates I used when I sold cars and did follow-up at Sunset Honda. DESKTOP VERSION OF WHAT CUSTOMER SEES: the email is short and has a plan of action that is guided toward a phone call. MOBILE VERSION: the email is easy to read from a mobile device. Not much scrolling has to happen. • you can use my special masking phone number tool or call from your cell phone. This is a repeat of step two and will be your third phone call attempt to the customer on this day. • this is another fast call, because if you get the customer’s voicemail you hang up. • this is another call you are hoping the customer see’s as a missed number and calls back if no voicemail was left. 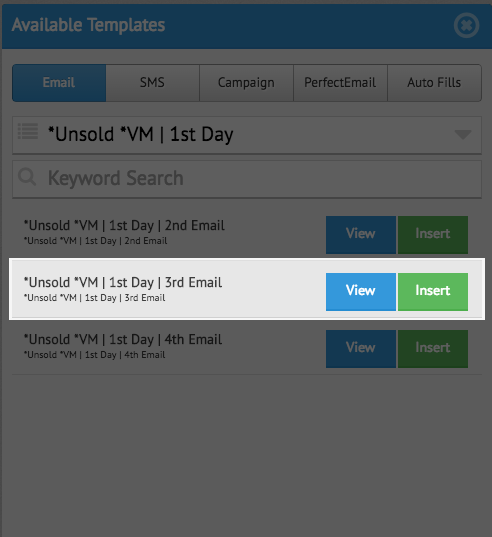 • ABOVE DESCRIPTION: this is an example again in CRMSUITE (also works in VIN Solutions, Dealersocket, CDK, Reyrey, Elead and any CRM that will allow template building) of how to organize the templates. By pathway, after phone calls and by email number. This is the third email on the first day now. • I hate templates too…at least when they don’t sound like they are written by a real human being. These are all words that you would find yourself writing over and over again to save time. DESKTOP VERSION OF WHAT CUSTOMER SEES: the email is another personalized look to the customer that is signatured sent from my iphone and guided toward a phone call. 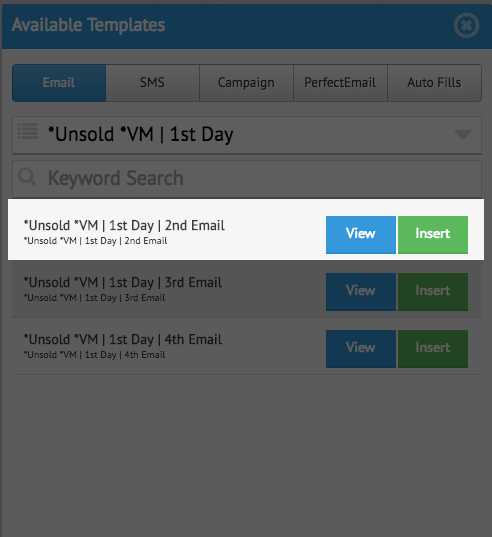 MOBILE VERSION: your emails should be mobile friendly as many customers will view on mobile. • this will be your closing call with a voicemail for the day. This voicemail has very similar bullet points as your opening voicemail only the expectation is that you will follow-up again tomorrow morning. 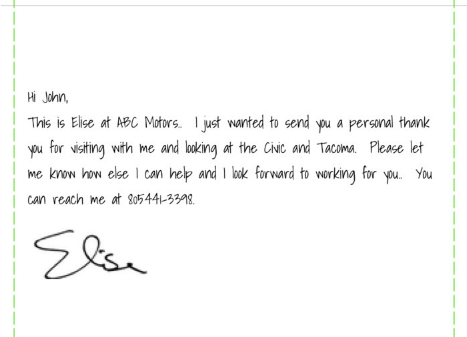 0:00 – 0:06: INTRODUCTION: Hello hello John, this is Elise again here at ABC Motors. Hope you’re having a fantastic day! 0:07 – 0:14: REACHING OUT AGAIN: Hey wanted to reach out before I left the office for the evening. Been trying to get in touch with you in regards to our visit yesterday on the Civic and Tacoma. • Reaching Out Again Description: this is where you repeat that you have been trying to get in touch. 0:15 – 0:19: GIVE REASON TO CALL BACK: I did have a couple quick things that I wanted to run by you and ask from our last chat. • Give Reason Description: this is in a repeated message format of what you said on your opening voicemail. Mix up your verbiage so it doesn’t sound exactly the same. 0:15 – 0:25: SHARE CONTACT INFORMATION: If you could do me a favor do me a favor and ring me back tonight when you have a quick few minutes. My direct number here again is 805-441-3398. I also sent you a text opt in earlier from my work cell phone – so that number works as well. 0:26 – 0:25: SET EXPECTATION: I am going to be in the office for a couple more hours or so till 6PM and I will be sure to try you again first thing tomorrow to make sure we speak soon. Really appreciate it. Talk to you then. Bye. • Expectation Description: this is where you close out the day and lay the groundwork for what will happen next. This is crucial because the follow two through ten days you will repeat this cycle and it should be of no surprise to the customer if they have heard it from the very beginning in all formats of communication. The expectation message is letting them know you will follow-up again. • ABOVE DESCRIPTION: this will be the closing drop down email for the day. It is in the unsold after phone calls folder and the fourth email in follow-up to the voicemail just left. • DAY 2 – DAY 10 UNTIL CONTACT IS MADE: call with a voicemail, drop and send email > call from cell phone, drop and send email > call from cell phone, drop and send email > call with a closing voicemail, drop and send email. • GET AN APPOINTMENT 100% OF THE TIME WHEN YOU GET THE LIVE PHONE CALL: there are three types of appointments that are guaranteed when you speak with a potential client/client. You will schedule a meeting appointment, a soft appointment or a phone call appointment. • SOFT APPOINTMENT: this is when the customer is unsure of an exact time but schedules a time frame or a tentative time. Take about ten minutes to listen to this call. The worst thing that happened was a couple objections. The phone call results in an appointment. The definition of insanity is doing the same thing over and over and expecting different results. Translation: if you are crying that customer’s aren’t calling you back and you’re stuck in that slump…do something different. “This is too much follow-up Elise. Customer’s would be so pissed if I did this.”: good – keep thinking that, because the more people that think this – the less people will actually do it, which means the few who put their follow-up game on fleek 1000% will get the engagement before you. They will grab the customer’s attention. They will get the trust and rapport to the phone call and they will take the phone call to an appointment. Meanwhile, you’ll be staring out that window or catching up on ESPN waiting for something to happen. *Sidenote: what makes this process work – is it’s getting in contact with the customer from every angle with the perfect blend of personalization and from the very first time you pick up the phone you lay out the ground work of your follow-up plan by setting the expectation that you will continue to follow-up. I have done it myself on a cradle to the grave follow-up plan, a BDC follow-up plan, a B2B follow-up plan and when I need to get a hold of anyone important. “I am not comfortable on camera. I don’t look good.”: I’m shorter than most, already have gray hair, put on some pounds since having two babies and being addicted to ice cream but it’s who I am and I am authentic. With video email you are able to be personable and let your personality shine – because it’s who you are. If you aren’t willing to be personable in this business- than you are in the wrong business. “I don’t have enough time.”: we all have the same 24 hours in a day and it’s all about how you spend them. Go all in with your lowest hanging fruit and you will get results. “What if the customer says they won’t talk on the phone?”: the best way to overcome an objection is to not get one in the first place. It’s crucial you sell the importance of a phone call and understand the value of a phone call versus text messaging or email. That being said – there are some customer’s who only will take an email or text and specifically put in the comments DO NOT CALL ME. Perhaps they want a price and your feet are to the fire and you have to send a price. Stay tuned for my next blog on how to accommodate the best price, do not call me customers. Great blog post. I will be sure to incorate these tried and true practices into my follow up process to get customers on the phone. What is the Elise Kephart Experience?